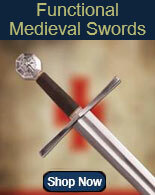 Radaelli Fencing Swords for sale are 40 ¼ inches in all. 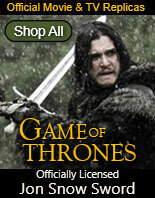 They feature a high carbon flex-tempered steel blade with a button-tip for safe fencing, stage combat and movie sparring. The functional 33 ¾ inch 9260 steel blade is flexible towards the button-tip. The 5 ¾ inch handle features a wire-wrapped sharkskin pattern grip and stainless steel guard. 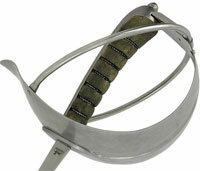 The fully-ridged guard features a classic reinforcing ring. They weigh approximately 1 pound 7 ounces. They are made to honor the famous Milanese fencing Master Giuseppe Radaelli. Radaelli used similarly styled fencing swords to train military troops. These swords are also popular with historical fencing societies who study late 19th century Italian style sabre fencing. Buy the Radaelli Fencing Swords for $179.99.